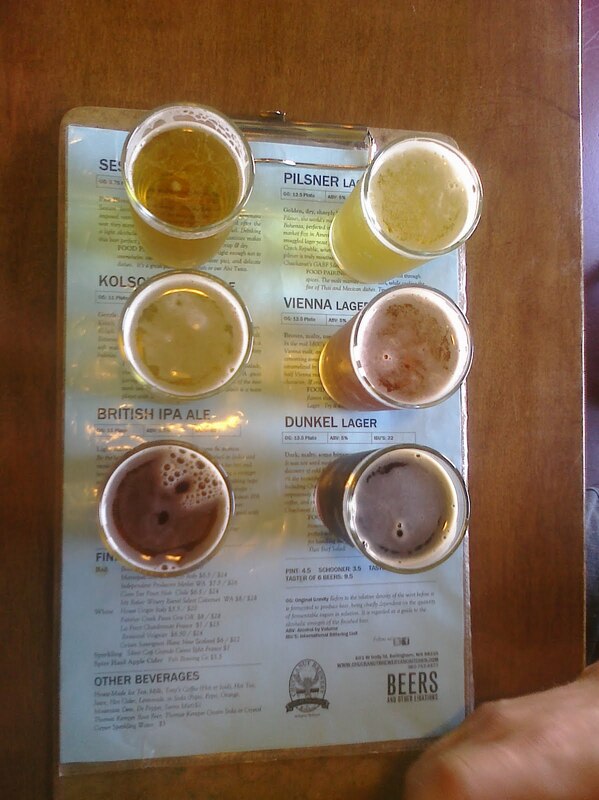 Lately, more and more of our travel plans seems to revolve around beer. And I don't mean just drinking it - I mean beer as a destination, whether it's a brewery, an event or just a bar with amazing craft beer selection. And this is a trend I am totally okay with. 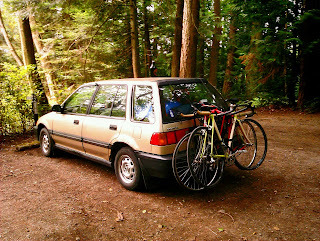 We left Vancouver Sunday morning, and headed for the Sumas border crossing in Abbotsford. 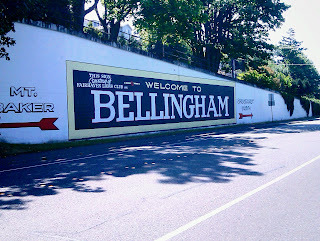 This was because our first stop wasn't actually in Bellingham - it was on the way, with just a tiny detour east. Our first stop? 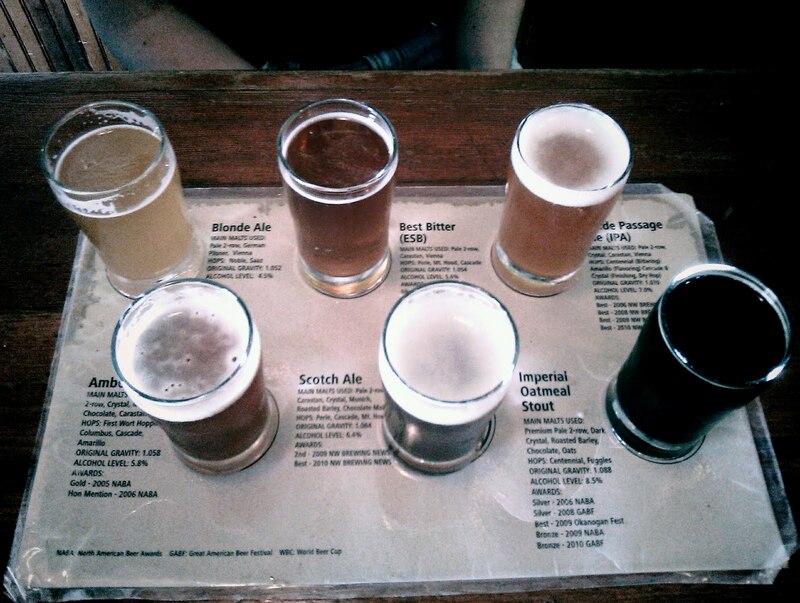 North Fork Brewery on Mount Baker Highway. Or, more accurately, North Fork Brewery/Pizzeria/Beer Museum/Wedding Chapel. Yes, you read that correctly - a wedding chapel. Their website says "Yes, we have an ordained minister on site, legally appointed to perform your nuptials, holy unions or commitment ceremonies." (excuse me while my mind explodes...) We were intrigued. Us: So where's the wedding chapel? Bartender: You're sitting in it. But now on to the important part: the beer. Belgian wits aren't at the top of my beer list, but this one was good. It was extremely light, high in carbonation (sparkles on the tongue!) and really, really refreshing. Perfect after a hot drive. This English-style ale had loads of caramel and a big, tasty malt profile. A nice toasty brown colour. These are all things I like. This one was my #1 pick. Wow. This was intense. Almost port-like in its sweetness and extremely high alcohol (13%). Very warming. I could see myself drinking this in front of a fireplace on Christmas Eve. Thin mouth feel, but full, malty flavour. Some hop bitterness and a hint of hop flavour. This was P's favourite. From its massive worn wooden bar top to its collection of eclectic old beer bottles to the steady stream of locals that came through the door, this place oozes character. I'd definitely recommend a visit if you're heading to Bellingham (it's only a few minutes longer than taking the I-5) or Mount Baker. Or, you know, if you want to get married. Two cold pints of their fantastic IPA in the sunny beer garden. The beer garden where they also had a bar, a pop-up kitchen and happy hour. Oh, the glorious experience known as happy hour that we are so deprived of in British Columbia. 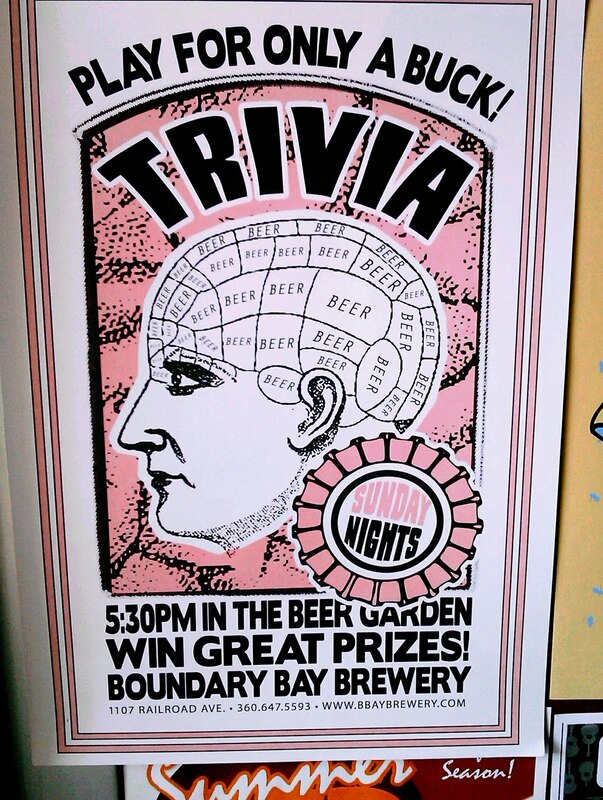 They also happened to be hosting $1 pub trivia in said beer garden (as they do every Sunday night). Needless to say, we were pretty happy about life at this point. 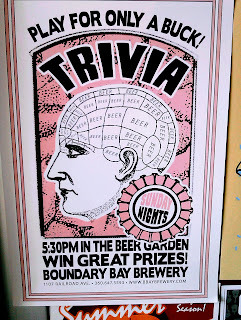 We may or may not have come last in trivia (there were a lot of questions about American presidents, okay?! ), but despite this, it was a fantastic night. We managed to befriend a couple of Vancouver transplants who even gave us and our bikes a ride back to our campsite (where we all split a growler of the BB IPA). A solid end to a solid day. We were such fans of Boundary Bay that we decided to go back the next day on our way out of town. But not before we stopped in at the other downtown Bellingham brewery - Chuckanut Brewery and Kitchen. Very clear, almost translucent golden colour. Dry, crisp and aromatic. Nice hop flavour. A legitimate, flavourful pilsner. A unique, full-bodied lager. Toasty, toasty, toasty. Light caramelly, malty flavour. Some bitterness in the finish. Not mind-blowing, but a tasty, drinkable beer. Nice reddish-brown colour. Toasty, malty flavour with a great smooth finish. Hints of nuts and molasses. I could definitely drink a couple pints of this in a sitting. Well deserving of its World Beer Cup award. And finally, to give their full beer offering a go, we stopped in at Boundary Bay again to grab a taster (and refill our growler). Obviously. This was both of our favourites of the entire trip. Rich copper hue, fairly thick head. Slightly sweet, floral nose. Extremely well-rounded, hoppy flavour. One of the most balanced, well-rounded IPAs I've had in a long time. Very refreshing. Hazy amber hue. Thick head. Dark malty, almost smoky flavour. Peaty, rich and delicious. I'm a big fan of scotch ales, and this was no disappointment. Rich, red colour. Good level of hops for an amber (but like the IPA, well-balanced). Easy drinking. Would be great with dinner. We also tried the seasonal Sorachi Ale, which was a tasty, sessionable single-hopped ale. We tried to refill our growler with the Sorachi, but got denied, so we settled for the IPA (which isn't really settling at all). At this point, tired, happy and full of delicious beer, we headed back to the Great White North after a fantastic 24-hour beer adventure. But this isn't the last you've seen of us, Bellingham - we'll definitely be back. Sounds like a great trip. I may have to round up some volunteers to replicate it!